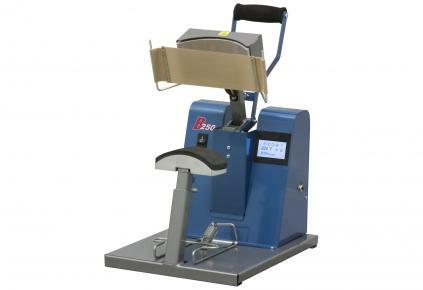 The HIX B-250 is a super portable hat press that's lightweight enough to bring to shows. The transfer hold down blanket ensures transfers don't shift. The B250 features a touch-screen controller with a digital timer. It is adjustable up to 999 seconds, shows time countdown on readout, beeps after elapsed time, and resets when the handle is raised. The calibrated digital temperature control is adjustable up to 232°C and displays the current temperature. The innovative bottom cap hold-down stretches the cap out, holding it snug to the lower (rubber covered) platen. A Teflon blanket is suspended between the upper and lower platen to hold the transfer (or lettering) in place before the heating element is locked down. The B-250 comes standard with a golf size (3" x 5-1/2") lower rubber covered platen.